I haven't yet seen any mention of Black Lightning in the new DCU, but I am sure it is only a matter of time before he appears in one form or another. In recent years DC had tried a few new looks for Jefferson Pierce, with varying degrees of success in my eyes. The look that I thought really worked the best was Cully Hamner's slight redesign of Black Lightning's original costume (adding in the black T-shirt and changing up his hair style), and I hope when we see the character again he will sport a look close to that. I have a feeling that if Black Lightning were a Marvel character, he would have been a frequent guest star in Marvel Team-Up. He and Spidey would make for a good pair. Black Lightning was the best thing about the original Batman and the Outsiders! 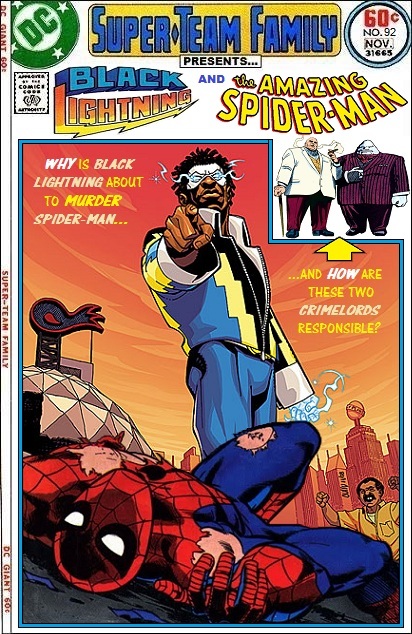 I hope to see Black Lightning again as well but I have a feeling DC is grooming Static Shock to take his place so they don't have to pay Tony Isabella for use of Black Lightning. With regard to the cover's questions? I would hazard to guess that Syonide used a tranuilizer dart, filled with some of the Corruptor's psychoactive pheromones, to set these two against each other. Tobias Whale providing the hench-wench. Kingpin having his men track down Jackson Day's hideout.